Luxury chocolate brought to a whole new level. Besides the flavors, the best thing about this company is that they use all natural ingredients, unlike most American chocolateries. 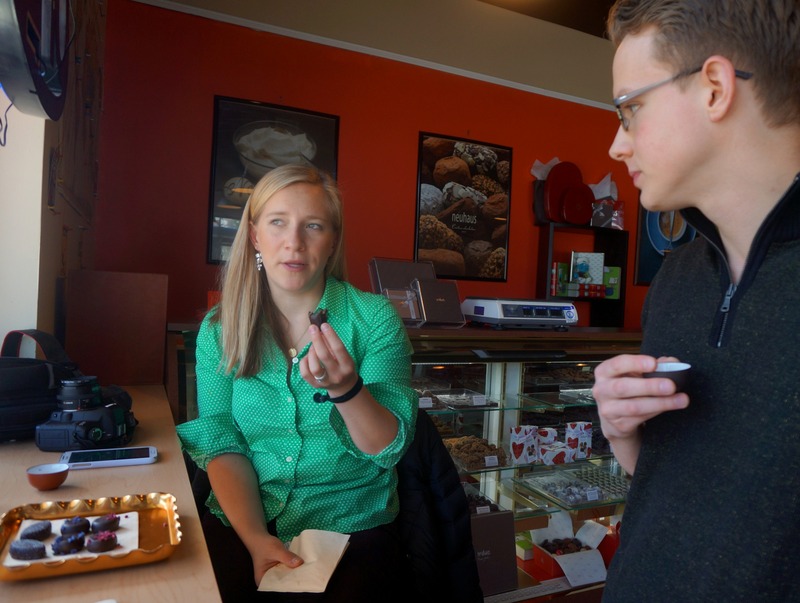 Here’s a helpful article on the entire art of chocolate tasting with all the minute details. 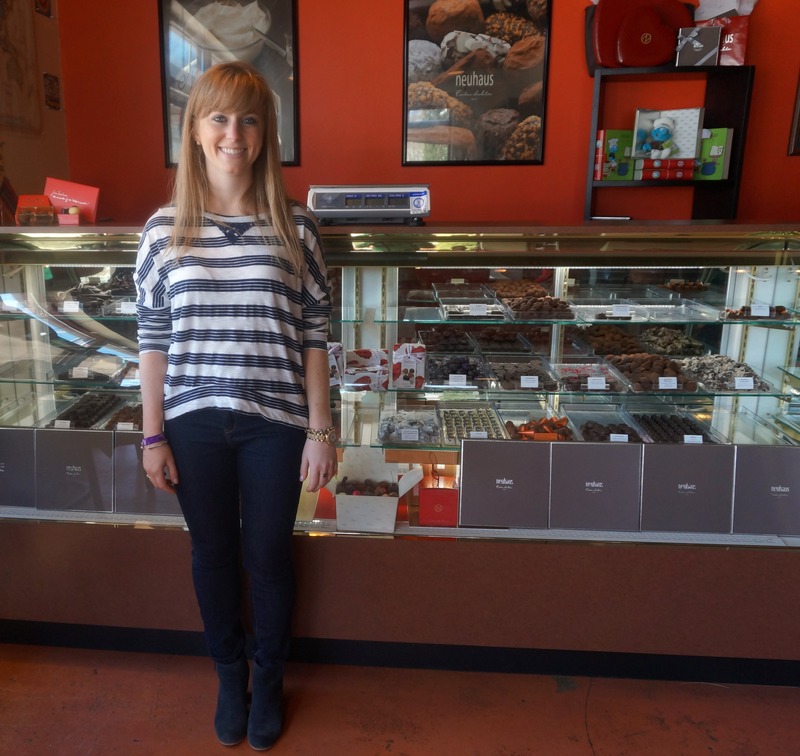 I brought along my new blog friend, Kath to accompany me through the luxurious journey of chocolate heaven. 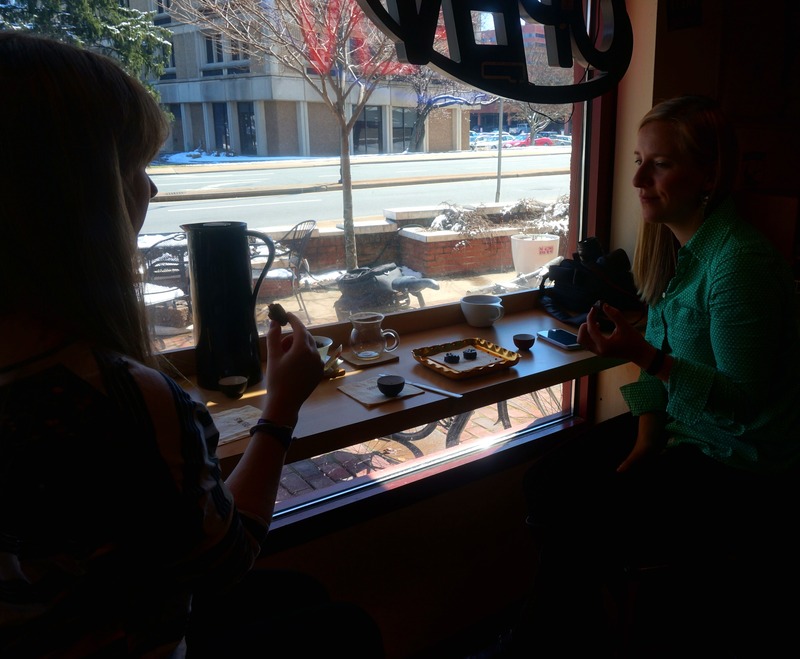 Yonathan, the owner, greeted us and had us sit near the front window to enjoy our tasting. He brought us understated bitter black tea as a refreshment to compliment the sweet chocolate. 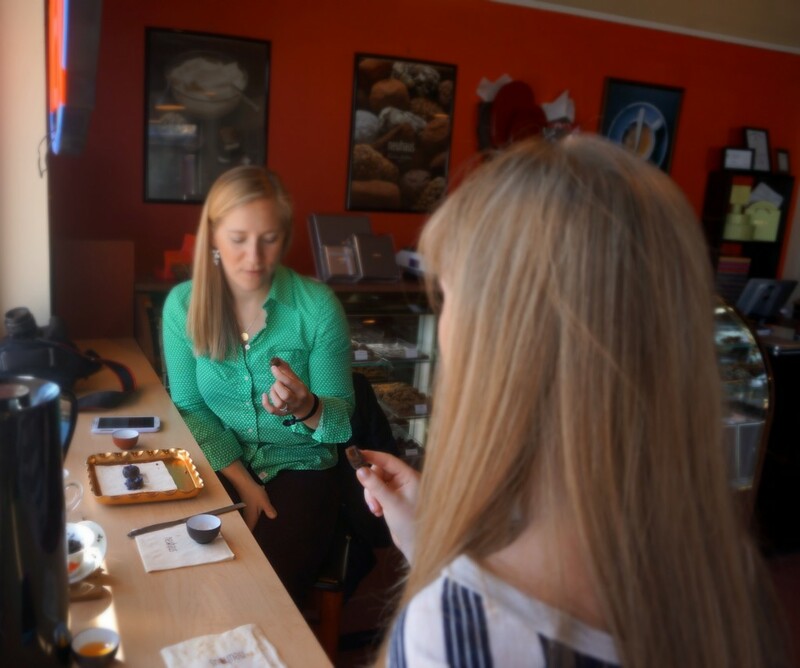 We sampled 5 rich dark chocolates perfectly assembled on a royal gold plate. We started with the Classic Truffle. 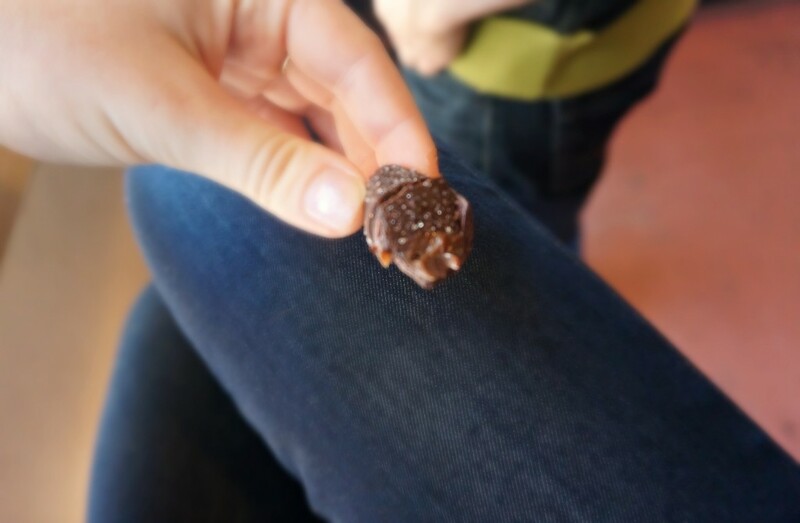 This was the only truffle we tried. By definition, a truffle is a rich dark chocolate butter cream enrobed in a thin layer of dark chocolate and dusted with a sweetener, like confectionary sugar or cocoa powder. I thought this piece was going to be overly bitter based on the cocoa powder dusting, but the delectable chocolate butter cream filling won me over. The dry exterior actually acted as the perfect compliment to the oozing rich center, gratifying the taste buds. 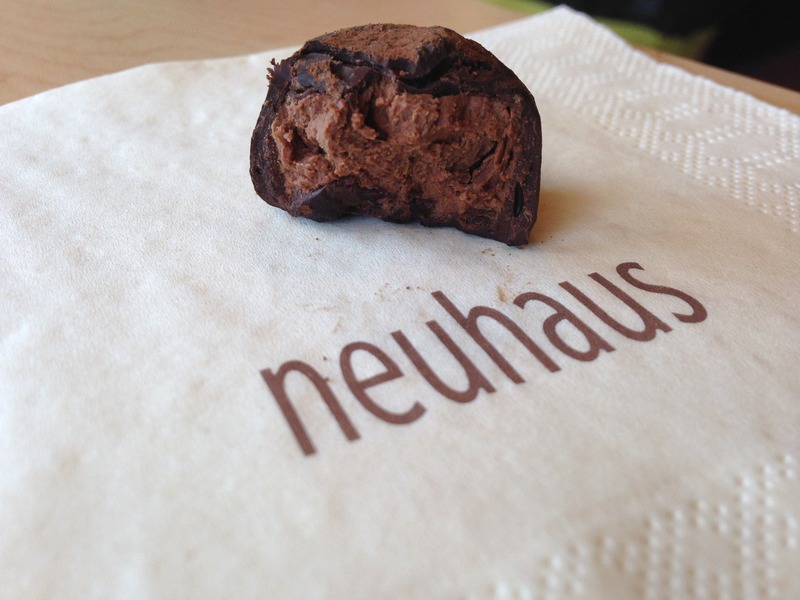 The second sampling was the Art Nouveau, an almond praline with nougat inclusions. Kath noted the consistency of the ganache was thicker and more honey-like than other ganaches. 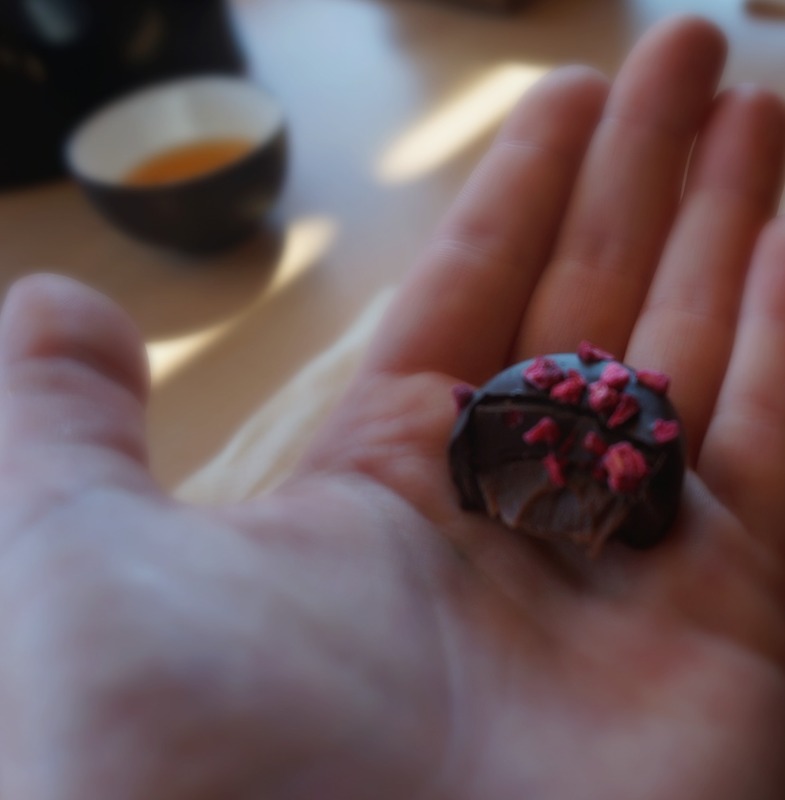 Next, we tried the Suzanne, a raspberry infused in rich chocolate ganache encased in dark chocolate. The dried raspberries, hand-sprinkled on top, added a colorful flair and create an extra crunch. I really enjoyed this praline’s tangy raspberry flavor. 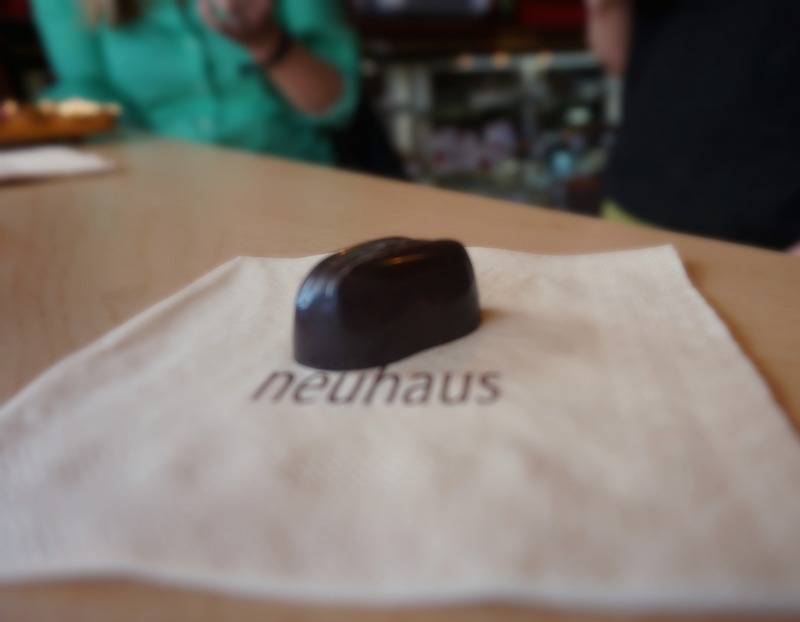 The fourth chocolate we tried was the Grand Place, named after the original store, with rich dark chocolate ganache infused with savory nigella spice (a mild Indian spice). The casting on the outside was dusted with crystalized Belgian beet sugar. (The same sugar used to make Belgian waffles.) 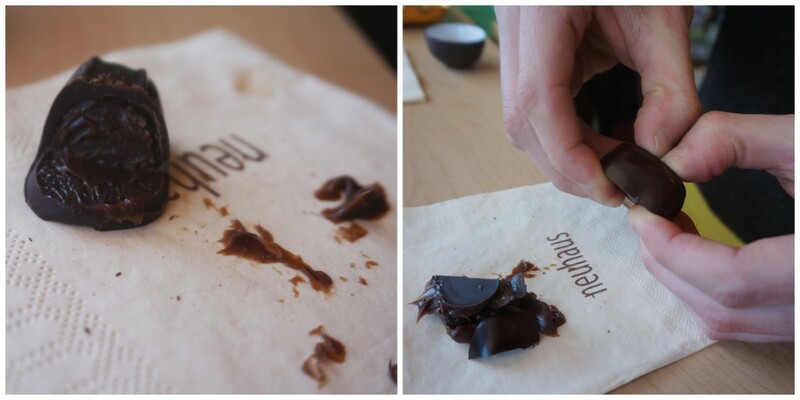 Beet sugar offers a balanced, complimentary sweetness without overpowering the natural flavors of the dark chocolate. Yonathan told us this piece pairs nicely with espresso. 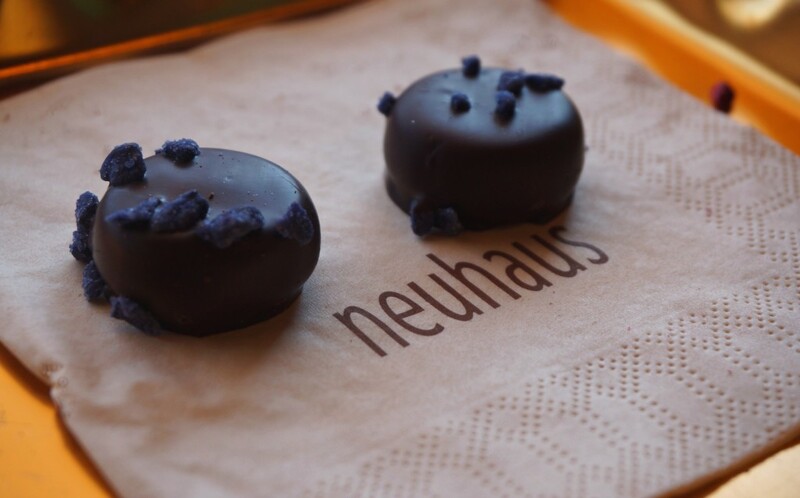 The final chocolate was the floral Violetta, a dense dark chocolate ganache infused with violet petals, enrobed in dark chocolate and topped with crystallized violet flower petals. It glistened at just the right angle. We agreed it tasted like the color purple and the violet petals offer an unexpected grape flavor with a rich finish. The little crystals lingered in my mouth, providing a burst of crunchy sweetness. 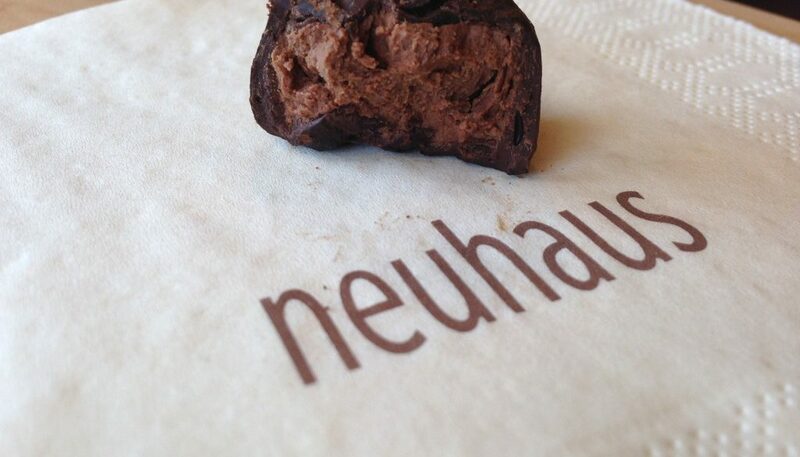 The flavors at Neuhaus are long lasting and are so much better than artificially sweetened chocolates. 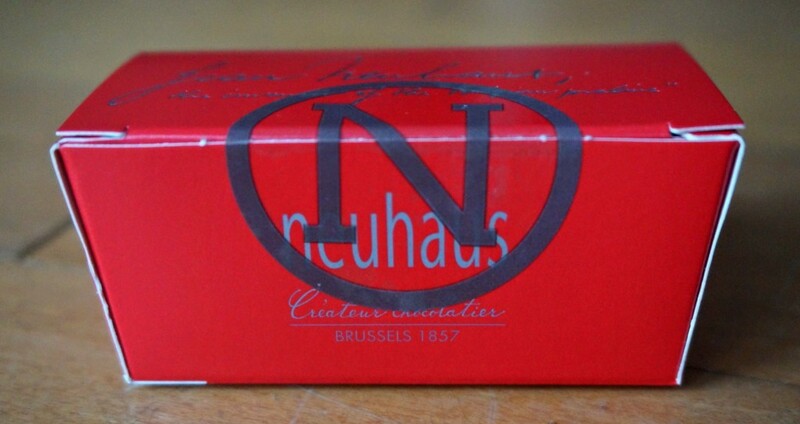 Neuhaus chocolate surprisingly didn’t give me a sugar hangover due to the all-natural ingredients. 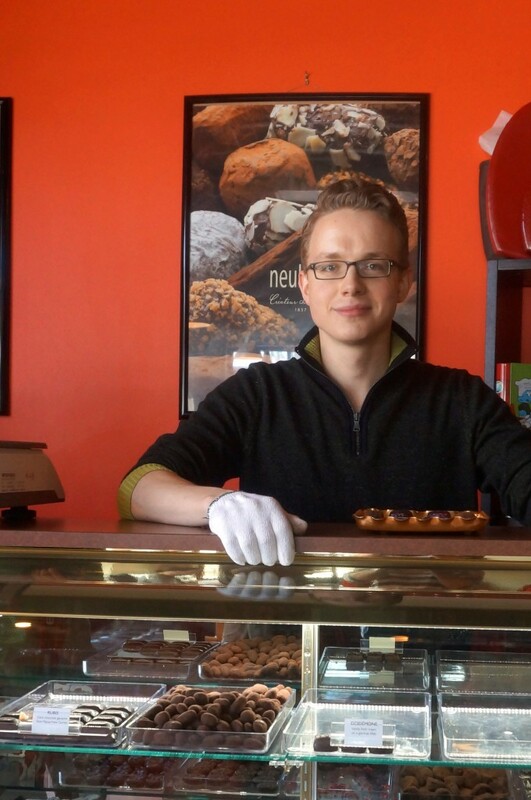 The best takeaway I learned here was taking the time to enjoy quality food, especially desserts. When you magnify the flavors and enjoy the process, you’ll inevitably eat less while still satiating your desires. It’s fun to learn about the process. Each piece is carefully crafted and can take many months to develop before it’s released in stores. 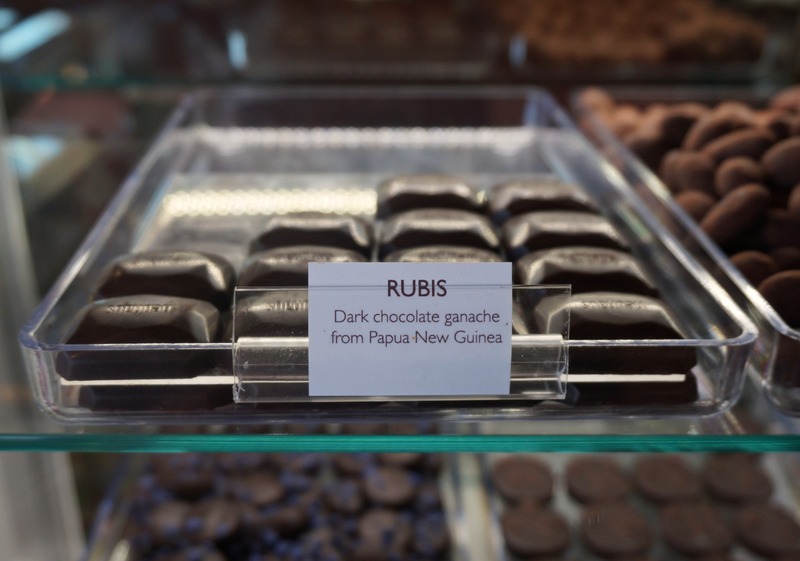 From flavors to textures, every marking on the chocolate has been well thought out. Even the name is carefully selected to define each piece. Are you craving fine chocolate yet? I know I still am. Thank you Yonathan for a lovely tasting! Disclaimer: While all chocolates were free of charge, all thoughts and opinions stated here are my own.